Mardi Gras Classic Slot Guide & Review - Casino Answers! 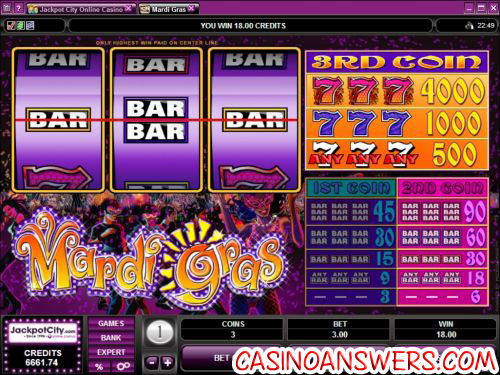 Mardi Gras is a 3-reel, 1-line classic slot machine developed by Microgaming. You can play the Mardi Gras slot machine game at River Belle Casino and All Jackpots Casino. Bets on the Mardi Gras classic slot machine are $0.25, $0.50, $1, $2 and $5. Once your coin size is set, hit the “Bet One” button to bet one or two coins or hit “Bet Max” to play Mardi Gras with all three coins enabled. Casino Answers recommends playing the maximum bet at all times on Mardi Gras due to the fact that the top three payouts are only available on spins playing the maximum bet. However, the lower five payouts will be the same as a 2-coin bet spin. The lowest total bet you can make on the Mardi Gras slot is a quarter per spin with the highest total bet being $15 per spin. To play the Mardi Gras slot machine, hit the “Spin” button. The highest paying symbol on the Mardi Gras slot machine is the Frilly 7 symbol. If you hit three of these symbols, you will win the 4000 coin top jackpot. The Blue 7 symbol is the second highest paying symbol; hitting three of them will win you 1000 coins. Three of any 7 symbol will pay out 500 coins. To try and hit the top jackpot, play Mardi Gras now at River Belle Casino! There are 8 winning combinations on the Mardi Gras classic slot machine game. The full payout schedule is as follows (1/2/3 coin payouts in parenthesis): 3 Blanks (3/6/6), 3 of any Bar symbols (9/18/18), 3 Single Bar symbols (15/30/30), 3 Double Bar symbols (30/60/60), 3 Triple Bar symbols (45/90/90), 3 of any Seven symbols (-/-/500), 3 Blue Seven symbols (-/-/1000) and 3 Frilly Seven symbols (-/-/400). To open up the autoplay mode on Mardi Gras Slots, hit the “Expert” button. You can play 5 or 10 autoplay spins, or hit “Autoplay” to open up the advanced settings. Here you will be able to set the number of spins (5, 10, 25, 50, 100, 250 or 500), number of seconds between spins, stop when jackpot is won, stop if a win exceeds or equals ($25, $50, $100, $250, $500, $1000 and $2500), stop on any win and stop if credits increase/decrease by ($25, $50, $100, $250, $500, $1000 and $2500). You can cancel the autoplay mode on Mardi Gras at any time. Mardi Gras lacks the some of the creativity we expect when we see a slot with a theme such as Mardi Gras. With that said, creativity doesn’t win you cash. You can still win a decent top jackpot here, although there isn’t much in the way of features. To play the Mardi Gras slot machine, sign up and make your first deposit today at River Belle Casino! If I’m from the USA, can I play Mardi Gras for real money? Unfortunately, American players cannot play the Mardi Gras slot machine for real money at Microgaming online casinos. You can find some party slot games at the US-friendly Crazy Slots Casino. Are there any other Mardi Gras themed slot games? Yes, there is another one! You can play the Mardi Gras Fever video slot at River Belle Casino and All Jackpots Casino along with the Mardi Gras classic slot machine. Where can I play the Mardi Gras online slot machine? You can play Mardi Gras at either River Belle Casino or All Jackpots Casino. For more information on All Jackpots, please read our All Jackpots Casino Review. Is there a free flash version of the mardi gras classic slot?